Great Copy pattern #880. 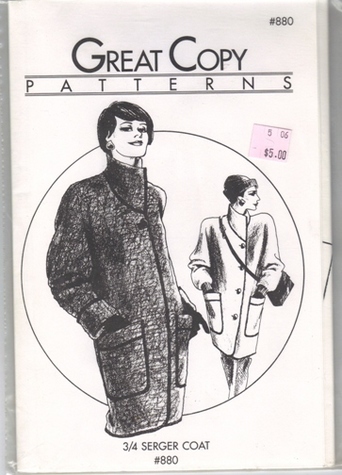 Ladies 3/4 Serger Coat pattern is multi-sized including Ex-sm thru Ex-lg. This oversized 3/4 serger coat features a convertible collar, dolman sleeves and a choice of ribbed cuffs or turn back fabric cuffs. The pattern is specifically designed for sergers. For Best results, trace the pattern before cutting. Suggested fabrics: Polar Fleece, Berber, Sherpa, wool coating, heavy sweatering and sweatshirt fleece. The pattern is new, uncut and in original packaging.